Today, the San Francisco Old Mint Commemorative Gold Five-Dollar Coin remembers the next day, April 19, 1906, after the terrible earthquake and the continuing fires raging through the city. At six o’clock last evening the flames seemingly playing with increased vigor, threatened to destroy such sections as their fury had spared during the earlier portion of the day. As night fell they had made their way over into the North Beach section, and springing anew to the south, they reached out along the shipping section down the Bay Shore, over the hills and across toward Third and Townsend streets. How far they are reaching to the south across the channel cannot be told as this part of the city is shut off from San Francisco papers. Those in the homes on the hills just north of the Hayes valley wrecked section piled their belongings in the streets and express wagons and automobiles were hauling the things away to the sparsely settled regions. Everybody in San Francisco is prepared to leave the city, for the belief is firm that San Francisco will be totally destroyed. Downtown everything is ruin. Not a business house stands. Theatres are crumbled into heaps. Factories and commission houses lie smoldering on their former sites. All of the newspaper plants have been rendered useless. The “Call” and the “Examiner” buildings, excluding the “Call’s” editorial rooms on Stevenson street being entirely destroyed. It is estimated that the loss in San Francisco will reach from $150,000,000 to $200,000,000. These figures are in the rough and nothing can be told until partial accounting is taken. On every side there was death and suffering yesterday. Hundreds were injured, either burned, crushed or struck by falling pieces from the buildings, and one of ten died while on the operating table at Mechanics Pavilion, improvised as a hospital for the comfort and care of 300 of the injured. The number of dead is not known but it is estimated that at least 500 met their death in the horror. At nine o’clock, under a special message from President Roosevelt, the city was placed under martial law. Hundreds of troops patrolled the streets and drove the crowds back, while hundreds more were set at work assisting the fire and police departments. The strictest orders were issued, and in true military spirit the soldiers obeyed. During the afternoon three thieves met their death by rifle bullets while at work in the ruins. The curious were driven back at the breasts of the horses that the cavalrymen rode and all the crowds were forced from the level district to the hilly section beyond to the north. The water supply was entirely cut off, and maybe it was just as well, for the lines of fire department would have been absolutely useless at any stage. Assistant Chief Dougherty supervised the work of his men and early in the morning it was seen that the only possible chance to save the city lay in effort to check the flames by the use of dynamite. During the day a blast could be heard in any section at intervals of only a few minutes. And buildings not destroyed by fire were blown to atoms. But through the gaps made the flames jumped and although the failures of the heroic efforts of the police, firemen and soldiers were at times sickening, the work was continued with a desperation that will live as one of the features of the terrible disaster. Men worked like fiends to combat the laughing; roaring, onrushing fire demon. No Hope Left for Safety of Any Buildings. But on the Barbary Coast the fire broke out anew and as night closed in the flames were eating their way into parts untouched In their ravages during the day. To the south and the north they spread; down to the docks and out into the resident section, in and to the north of Hayes Valley. By six o’clock practically all of St. Ignatius’ great buildings were no more. They had been leveled to the fiery heap that marked what was once the metropolis of the West. The first of the big structures to go to ruin was the Call Building, the famous skyscraper. At eleven o’clock the big 18 story building was a furnace. Flames leaped from every window and shot skyward from the circular windows in the dome. In than two hours nothing remained but the tall skeleton. By five o’clock the Palace Hotel was in ruins. The old hostelry, famous the world over, withstood the siege until the last and although dynamite was used in frequent blasts to drive the fire away from the swept section toward Mission street, they made their way to the point of the hotel until the old place began to crumble away in the blaze. The City Hall Is a complete wreck. The entire part of the building from Larkin street down City Hall avenue to Leavenworth, down from top of dome to the steps is ruined. The colossal pillars supporting the arches at the entrance fell into the avenue far out across the car tracks and the thousands of tons of bricks and debris that followed them piled into a mountainous heap. The west wing sagged and crumbled, caving into a shapeless mass. At the last every vestige of stone was swept away by the shock and the building laid bare nearly to its McAllister street side. Only a shell remained to the north, and the huge steel frame stood gaping until the fire that swept from the Hayes Valley set the debris ablaze and hid the structure in a cloud of smoke. Every document of the City government is destroyed. Nothing remains but a ghastly past of the once beautiful structure. It will be necessary to entirely rebuild the Hall. Mechanics’ Pavilion, covering an entire block, went before the flumes in a quarter of an hour. The big wooden structure burned like tinder and in less time than it takes to write it was flat upon the ground. They had stolen their way out from the Mission while a dense crowd blocked that street. So quickly did they make their way to the north of Market that their approach was not noticed. When it was realized that the danger had come to this particular residence section, the police and the cavalry drove the crowd back in haste to the north and out of harm’s way. Down Hayes street playing the cross streets coming on like a demon, the fire swept over St. Ignacious Church, leveled barns and houses, and, as if accomplishing a purpose long desired, blazed down to the front of Mechanics’ Pavilion. Only shortly before the patients in this crude hospital had been removed to other hospitals in outlying districts. From the big shed the flames spread to the north, east, south and west, everywhere. Confusion reigned. Women fainted and men fought their way into the adjoining apartment houses to rescue something from destruction — anything, if only enough to cover their wives and their babies when the cold of the night came on. There was a scene that made big, brave men cry. There were the weeping tots in their mothers’ arms wailing with fear of the awful calamity; salesmen and soldiers fighting to get the women out of harm’s way through the crowd; heroic dashes in the ambulances and the patrol wagons after the sick and injured and willing men, powerless as the mouse in the clutch of the lion, ready to fight the destroyer, but driven back step by step while their homes went down before them. 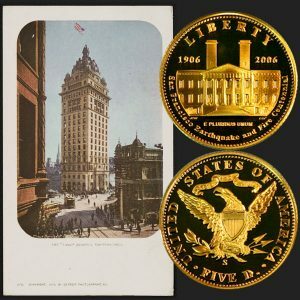 The San Francisco Old Mint Commemorative Gold Five-Dollar Coin shows with an image of the Call building, circa 1900.